I went to my first wedding of the season this past weekend. It was magical, romantic, beautiful, and reminded me of one essential tidbit: When it comes to weddings, waterproof mascara is a must. Here’s the thing: I get emotional over everything, and tear up watching anything from rom coms to sentimental commercials, so when it comes to wedding ceremonies, it can get messy. But with a pocket full of Kleenex and the best waterproof mascara on my lashes, I was able to combat raccoon eyes for the remainder of the night. Since wedding season is upon us, it’s important to be equipped with waterproof mascara, especially if you turn into a blubbering mess like me. But it’s not only great for weddings, it’s also handy for intense workouts, swimming, and inclement weather, which can send regular mascara streaming down your face by the time you get to work. And did you know that waterproof mascara actually gives your lashes more curl than other mascaras do? Voluminous mascaras tend to weigh your lashes down, so if you have naturally straight lashes, waterproof mascara is for you! Each of the mascaras below will give you voluminous, gorgeous lashes with length and definition. Plus, they won’t budge, whatever you may have planned. Another great thing about waterproof mascara? If you’re battling oily eyelids, it’s the key to zero smudge. Say goodbye to black streaks on your eyelids throughout the day – with waterproof mascara your eyes will be perfect and smudge-free. Not all waterproof mascaras are made the same, that’s why we’re showing you the best waterproof mascara of 2016. From CoverGirl LashBlast (my personal favourite!) to Diorshow Black Out, these are the waterproof mascaras you need in your makeup bag! If you’ve read any of my other makeup posts, you probably know my love for CoverGirl LashBlast mascara. It’s the mascara I wear on the daily, and even when I try more expensive ones, it’s the one I keep coming back to. It gives your lashes amazing volume and definition and I would recommend it 100 times over! So, of course the waterproof version is my top pick! The brush extends your lashes giving you volume and fullness and the waterproof formula promises a no-smudge look! It’s also hypoallergenic, so you’ll have no problems if you wear contacts (like me!). The name of this mascara says it all. Swipe it on to get an intense black kohl colour and amazing volume for your lashes. It’s 100% smudge-proof so you can wear it anywhere from a wedding to a kayak trip. Your eyes are sure to pop with this one, and seeing that it’s Dior’s best-selling waterproof mascara, if you choose this one, you’re in good company. This waterproof mascara is ideal for those with sensitive eyes, and its slimline brush makes it quick and simple to apply. It dries quickly and will last all day and night, or through your toughest workout. You can even wear it swimming if you want – it’s sure to stay put and not smudge a bit! A long-time favourite of many makeup wearers, Maybelline Great Lash knows how it’s done, and their waterproof version is one of the most-loved! It conditions your lashes while it thickens them, and the waterproof formula goes on smoothly, without any smudge. It’s available in multiple different brushes, so you can choose depending on the type that works best for your lashes. I’ve tried this mascara a couple times as it’s my mom’s go-to, and I really love it! It provides great volume and really intensifies your lashes for a gorgeous look. The waterproof version has 16-hour stay power and is ultra-resistant for your most tear-worthy days. It won’t smudge or clump, but will make your lashes soft and supple. At such an affordable price point, you can get so much with this mascara! 400% fuller lashes, to be exact! The waterproof formula is infused with olive, which penetrates and plumps each lash. The super-size volume brush also plumps up even the smallest lashes, so you’ll have beautiful and rich lashes no matter what. If you’re not a fan of clumps or flakes (who is?) then this is a must for your makeup bag! Build up stunning lashes with this amazing waterproof mascara by Clinique. I love Clinique products – they’re all such great quality. With this mascara you’ll be able to withstand sweat, heat, humidity, and anything else that comes your way – including waterworks! It’s safe for sensitive eyes, as well as for anyone who wears contact lenses. If you’re an athlete who’s looking for a mascara that won’t budge during sports, we’ve got just the one for you! The uniquely curled brush catches every lash and the waterproof fiber-enhanced formula will see you through any workout, no matter how tough! It lasts up to 24 hours, and has also won awards! Leave it to Chanel to come out with a waterproof mascara that delivers it all – length, curl, volume, and definition. The unique brush design ensures the mascara goes on seamlessly and makes your lashes look flawless. And they’ll stay that way! It holds up well in any sort of heat and humidity, plus sports, the pool and inclement weather. The brush is what makes this mascara one of the best! It’s a two-in-one, cone-shaped, synthetic fiber brush with a precision tip, which separates lashes and creates amazing volume! Plus, the waterproof formula ensures long-lasting wear that won’t clump or smudge. 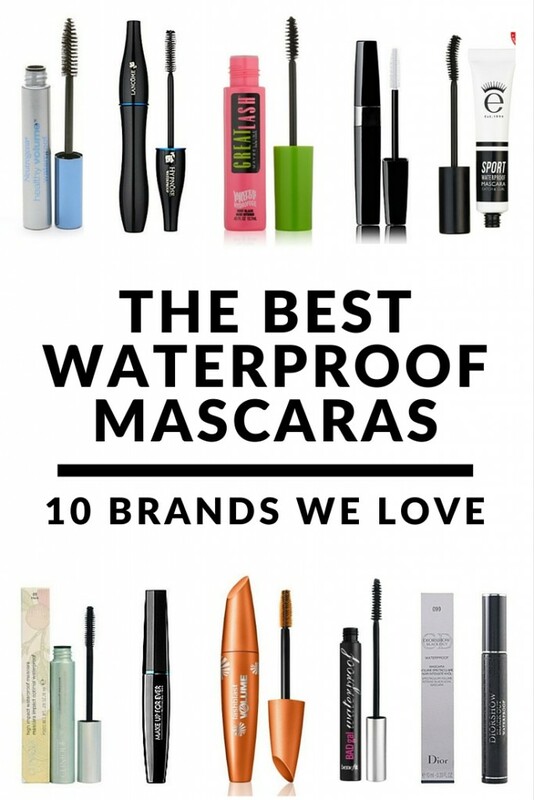 These 10 waterproof mascaras are sure to get you and your eyes through anything from water sports to your best friend’s wedding. They won’t smudge or clump and you’ll be able to enjoy yourself without worrying about mascara streaming down your face. You’re welcome! If you found this collection of the best waterproof mascaras helpful, please share it on Pinterest!